Photographed in Phoenix, Maricopa Co., Arizona. May 2007. 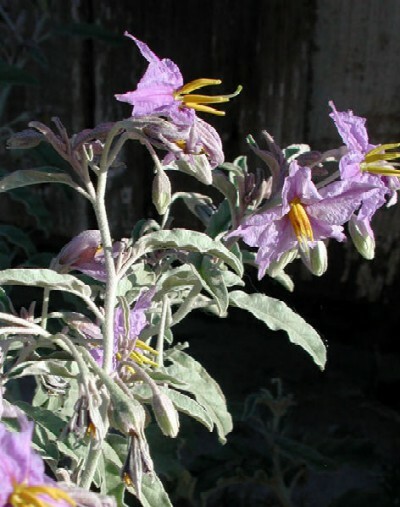 This photo is hosted in full resolution at Wikimedia where there are additional images of various Nightshades. During the hot summer months Sonoran Bumblebee (Bombus sonorus) might be seen visiting the flowers soon after sunrise. These same bees are also effective pollinators of the closely related tomato plant. Thus these weeds may help the gardener by supporting a population of bees that the tomatoes require in order to set fruit. RANGE: Common in the Sonoran Desert of Arizona mostly where irrigation is provided - and especially on overgrazed pasture. Along ditch banks and alley ways, but also on the flood-prone terraces near rivers or streams. LEAVES: Elliptical and silvery. Alternate. Smooth, but slightly wavy, margins. FRUIT: Bright yellow berries remain on plants for extended periods and become dryish capsules. Toxic. PERENNIAL: Re-grows year after year from underground stems and can form large patches of half-meter tall stems. Fresh growth appears mid to late spring and grows best during summer and into fall. FLOWERS: Attractive purple flowers, blooming late spring to fall, with five prominent yellow stamens. The yellow stamens visible in the photograph are vase-shaped with pore openings at the apex. Specialized bees access the pollen by ‘buzzing’ and thus vigorously shaking the vases. The pollen grains bounce out of the top pores and are caught on the setae (insect hairs) of the bee. ARMED. Usually has sharp prickles on the stems although some plants are nearly free of spines.